Add Service Desk to your existing workflows and apps to save time and effort. Developers can use our application programming interfaces (APIs) to connect Service Desk with other solutions, such as CRM tools or IT management platforms. While this does take a little work upfront, the end result is worth it. You free up time by cutting out repetitive data entry and extra tasks. There are API calls for many different things you’d want to do in Service Desk. You can retrieve a list of incidents, create new ones, show time entries and much more. View the GoToAssist Service Desk API Guide to learn about all the available calls. 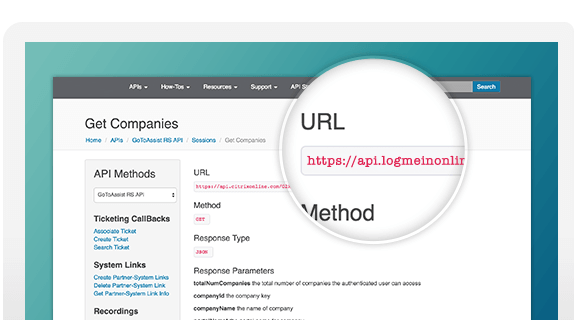 Service Desk supports XML and JSON formats, and it uses Basic Auth and cURL for API authentication. Service Desk also creates a unique API token for each account and user. When you make a request, the username you enter is ignored, but your password must be your API token. Stay informed with automatic email reports on a range of metrics. Quickly log, track and route issues and tasks for your technicians.